Chinese scientists used low-temperature plasma to treat antibiotics in water, and revealed the mechanism and degradation pathways of the progress. The research was conducted by Prof. Huang Qing and his team in the Institute of Technical Biology and Agriculture Engineering, Hefei Institutes of Physical Science. Antibiotics are commonly used for clinical treatment, but they are often released to water from medical institutions, which put potentially environment and human health at risk for they would aggravate the problem of bacterial resistance to antibiotics as a result. Therefore, scientists have been seeking for an easy and efficient method to treat antibiotics released into water. 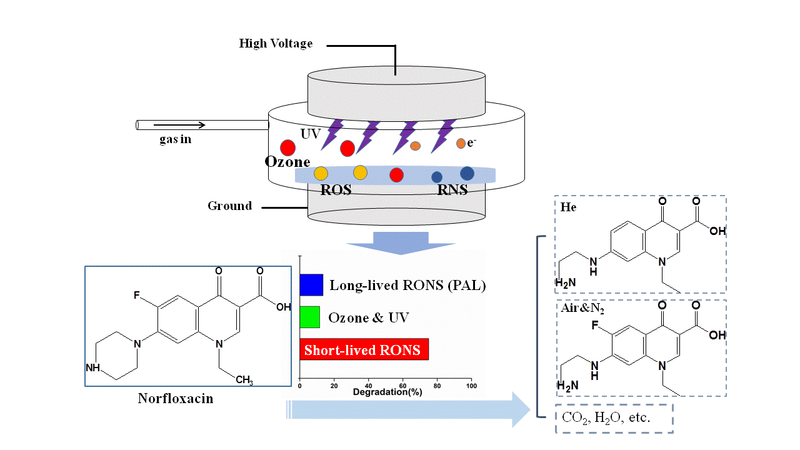 HUANG's group took norfloxacin that is extensively used in clinics as the test drug, and studied the effect and mechanism of its degradation with low temperature plasma under different gases. They found that the treatment efficiency was the biggest for the helium plasma discharge, followed by oxygen, air and nitrogen plasma discharges. They also confirmed that hydroxyl radical is the main factor for the degradation of norfloxacin. In addition, they discovered that by adding hydrogen peroxide, the efficiency of nitrogen plasma treatment could be significantly enhanced. What’s more, ultraviolet and ozone produced during the discharge had a certain contribution to the degradation effect. This research work provides a theoretical support for plasma treatment of antibiotics as well as a basis and direction for the future application of low temperature plasma to treat antibiotics in medical wastewater. This work, in cooperation of Anhui Hua-Feng Company, was supported by the National Natural Science Foundation of China and the Anhui Provincial Natural Science Foundation.